So no 'Bread of the Week' this week. Oops. Well I might give naan bread a go later today now I have a grill that works. I usually buy the packet mix but was thinking to myself, how hard can it be to make your own? Watch this space. Anyway, healthy has to be the watch-word now. I *still* have to shift my last stone of baby weight. Personally I blame my gynaecologist. He told me a few years ago to run less and put on some weight if I didn't want to go down the IVF route. That was the best thing I ever heard. I ran less, I put on weight (btw, I was hardly skinny at 10.5 stones!) and hey presto, free baby! But that was nearly three years ago and now I have to get back to running and eat less as there will be no more little Crowdeys. Ever. Losing weight (for most people) is a simple case of calories in < calories out. It's hardly rocket science. You just have to know that your healthy looking salad may just possibly have copious amounts of calories and saturated fat lurking behind that innocent looking rocket leaf and maybe you should eat something else instead - and Bob's your uncle. And because I'm such an early bird where work is concerned, I really have to watch what I have for my breakfast. Given all the time in the world, I'd eat porridge or granola and yogurt or Bircher muesli every day. But I leave for work at 6am so if I ate that early, I'd be hungry again by 8am, thus defeating the object of a good breakfast as I'd be at the vending machine or over at canteen eyeing up the bacon butties. Nom...nom...nom. So I try to be good and take breakfast to work and as a rule never eat before 8am no matter how hungry I may be. This week, I'm out and about so need something portable. 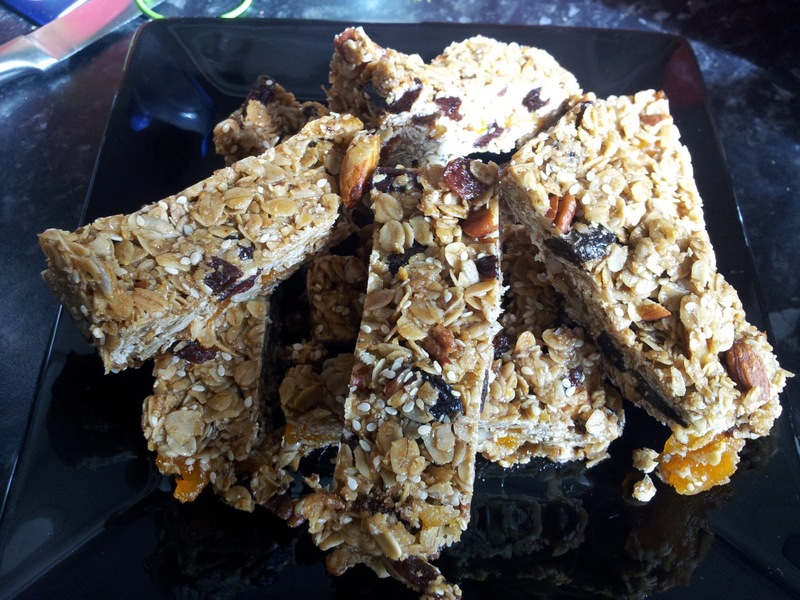 I used to have a good recipe for granola bars which I've lost (it may be on my old blog actually) so I found a new one on the BBC Good Food website. Very tasty although I would definitely add a pinch of salt to the ingredients if you use unsalted butter like what I do as it cuts through the sickly sweetness of the syrup. I also found them really hard to cut without falling apart (them, not me!) so I stuck the tin in the freezer for 15 mins to make sure they were properly chilled and it worked like a charm. One final note - always line the tin. I managed to wreck the non-stick on the base of my favourite cake tin with the palette knife. Really fab product for lining is the Lakeland parchment lined foil. I have a huge roll in my cupboard and am kicking myself for not using it. It's great as you can actually fold it into shapes that keep their structure and won't keep curling back on itself once it's in the tin.